Mother’s Day is just around the corner and to celebrate Bledtec is offering free ground shipping on all blenders purchased from their website starting today Friday, April 29th and running through Sunday, May 8th. No coupon needed – the free shipping promotion will automatically apply to all products in the cart. From smoothies, dips and soups to pureeing baby food, grinding coffee and blending up a mean margarita, this has become my all-time favorite blender. Check out my full review here. 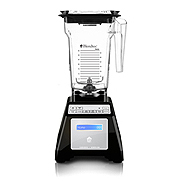 Visit Blendtec.com to see their selection of new and reconditioned blenders. « #RoyalWedding: What Did You Think of Kate’s Dress?